Have you ever walked into your apartment and felt the need to apologize to it? "Oh god, I'm so sorry. Yes, I know. I'll vacuum you soon. Aw, jeez, I know it's bad. I'll take care of those dishes as soon as I can. I've just been so busy! I'm sorry!" Your home can't be your sanctuary if its messy state makes you feel guilty. Here are two quick ways to cut the tension with... tension rods. In the kitchen, you can use small tension rods to help organize a few perpetually-frustrating areas: that drawer of pots, pans, and their lids, and that oxymoronic messy cabinet full of cleaning supplies. Found on Pinterest (by the way, I'm finally on Pinterest! Come say hi! ), this is a quick and clever way to bring your spray bottles up off the cabinet floor, clearing some room for more cleaning essentials. 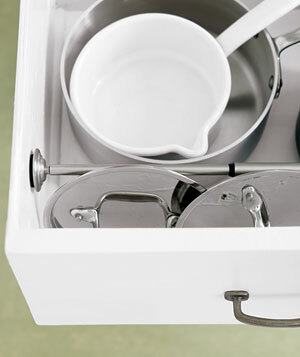 And via Real Simple, you can use a rod to corral your lids, keeping them neatly upright against the drawer and allowing you to quickly see and grab the appropriate one. All it takes is a quick trip to the Home Depot, and you and your apartment are on speaking terms again. It's also a lot cheaper than couple's therapy. Via Pinterest and Real Simple. I really can relate. Same thing happens in my apartment. This is a great idea - and adaptable to any kind of tiny apartment! Whoo! This is a very useful tip for those people who are very busy with their jobs. I will definitely share this with my busy friends as well. Fitting in my schedule my home duty of cleaning is really hard, so thanks for this. Great help. I love that lid idea. I never know how to deal with them! Useful tip! I know that apartment unit should be always clean. No one could afford living in a place with a lot of mess around. Thanks for this post.